Designed to look like a child's workbook, the 10 minutes a day® book is an approachable and fun program for everyone. It covers the material equivalent to more than a year of high school Norwegian or the first quarter of Norwegian at university. It's a refreshing alternative to boring textbooks and you'll be surprised at how much you learn. 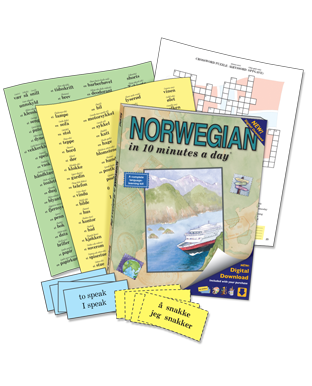 Use the book to guide you, step-by-step, through learning and speaking Norwegian. 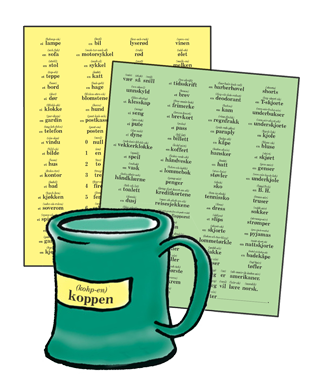 With the Guide and simple phonetics above each Norwegian word, it's easy to begin speaking Norwegian with the correct pronunciation. Sounding similar to their English counterparts, these Norwegian words take no extra effort to add to your vocabulary. 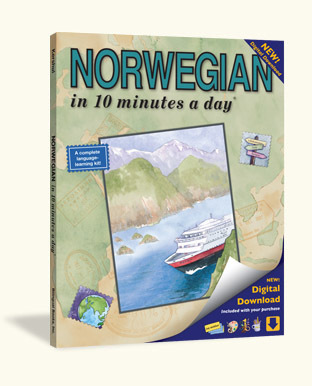 You can quickly look up a Norwegian word, its pronunciation and definition. NORWEGIAN is spoken in . . . Norway and Svalbard.